On the eighth anniversary of the landmark Global Asbestos Congress 2004 (GAC 2004), I arrived back in Tokyo for a series of asbestos activities. It seemed that history was, once again repeating itself. My first trip to Japan was in April 2004, in preparation for GAC 2004 which was to take place seven months later. I had been invited by the organizers to visit asbestos victims' groups in Tokyo, Osaka and Yokosuka to discuss global asbestos issues and learn about Japanese developments. At the same time, my colleague Dr. Barry Castleman was also traveling about Japan speaking to members of the medical and academic community about the forthcoming Congress.1 Our activities only overlapped on my last day in Japan when we participated in a meeting at the Tokyo headquarters of the International Labor Organization. In 2012 things were different, but not so different. While Dr. Castleman was not in Japan, Dr. Helen Clayson, former director of St. Mary's Hospice  a renowned institution serving the population of the asbestos hotspot Barrow-in-Furness  had arrived for a week of lectures and presentations. Once again, our schedules coincided only once. On November 23, we met with some of the colleagues hosting our visits. UK community-based care (i.e. District Nurses) is uncommon in Japan; in some parts of Japan there is, however, limited outreach support for home-based patients which is provided by teams from certain hospitals. audiences were surprised to hear that UK patients are now told of diagnoses and likely prognosis of serious illnesses while their relatives are only told if the patient consents; in Japan, the situation is reversed. there was surprise that radical mesothelioma surgery was uncommon in the UK; for Japanese patients this is the preferred option, where possible. people were fascinated by the idea of asking patients their preferences regarding end-of-life care; nevertheless, they seemed to think this was a good idea. similarly audiences were intrigued as well as supportive of the UK practice of training healthcare staff in communication skills. Beginning my visit to Japan on November 22, I was able to catch up with friends whose efforts had been crucial to the success of GAC 2004: Dr. Temmyo Yoshiomi, Chairperson of the Organizing Committee, his friend and colleague Dr. Ryuta Saito, a Congress participant, and Rie Monika Ikeda, from the Kanagawa Occupational Safety and Health Centre and the Yokosuka Pneumoconiosis and Asbestos Victims' Group. Reminiscing about the activities which took place in Tokyo eight years ago, we discussed subsequent events including the occurrence of the Kubota Shock,3 just a few months after the Congress. 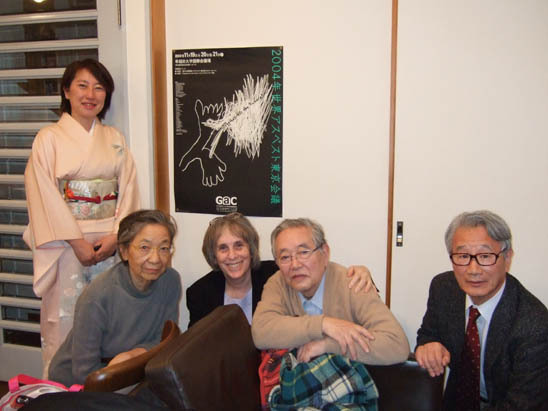 Dr. Temmyo, who described November 2004 as the busiest month of my life, has the iconic GAC 2004 poster hanging on his living room wall. To mark the occasion of the 8th anniversary of this landmark event a photo was taken of our gathering underneath this poster. 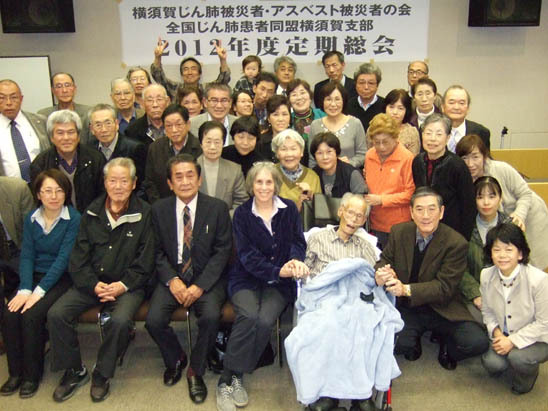 Pivotal to the success of GAC 2004 had been the support, input and participation of Japanese asbestos victims' support groups including that of the Yokosuka Pneumoconiosis and Asbestosis Victims' Group. Saturday, November 24, 2012, was the Annual General Meeting (AGM) of this organization and I was pleased to accept an invitation to address the meeting. Arriving early in Yokosuka with Rie Monika, I was able to visit the new location of the Yokosuka group which meets in a modern three-storey building near Yokosuka Hospital. Staff working at this Clinic, which is based in a building owned by the Pneumoconiosis and Asbestos Victims' Relief Fund,4 provide a range of services for asbestos victims including practical support, medical assistance and counselling. 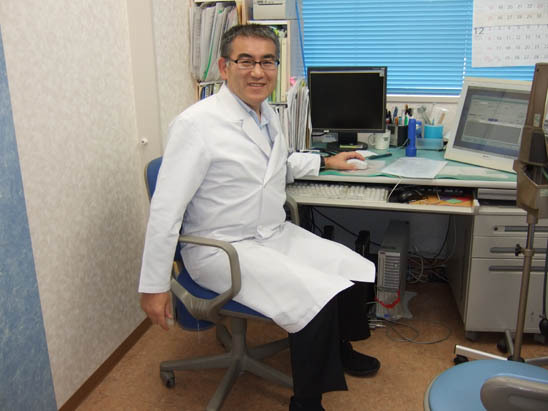 Dr. Meiro Haruta, Director of Yokosuka Central Clinic. Staff member Rie Monika in her office. Nurses  from left: Ms. Yukiko Tsuruta and Ms. Taeko Niikura. 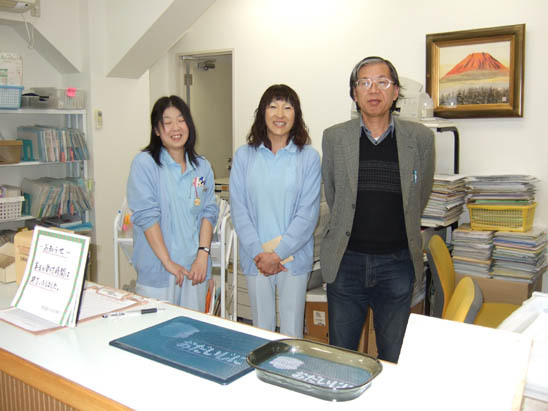 Staff  From left: Ms. Naoko Kozumi, Ms. Yuko Kuroda, and Mr. Munehiro Yasumoto. Due to its industrial heritage, Yokosuka is one of Japan's asbestos hotspots. Looking at the geography it is easy to see why; to the east of the city is Tokyo Bay and to the west is the Pacific Ocean. For decades, shipbuilding and dockyard companies were important employers in this city of 400,000+ people. 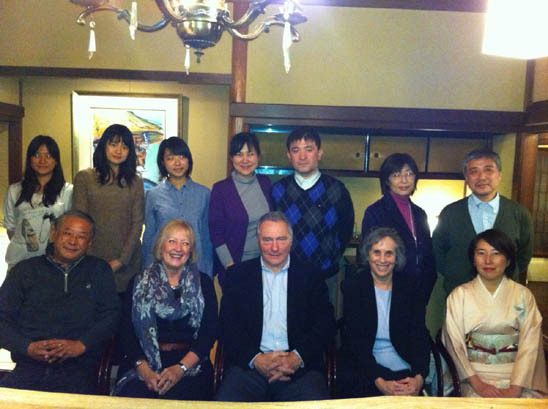 The Yokosuka Pneumoconiosis and Asbestosis Victims' Group, which was formed in 1985, has played an important role in uncovering the deadly human consequences of the occupational, environmental and domestic asbestos exposures which took place here. Local asbestos victims who had been employed at the U.S. Naval Base mounted ground-breaking and successful legal actions arising from their occupational exposures at the dockyard. Other cutting-edge litigation mounted on behalf of members of this group include actions by railway and construction workers; while a lawsuit on behalf of railway worker Susumu Kato was won in 2008,5 the results of the construction workers' lawsuit remain pending. The well-attended AGM was honored by a surprise visit from the Group's former President: Mr. Hirofumi Ochiai who, despite the advanced stage of his asbestos-related illness, was determined to participate.6 After the annual reports were presented by officers of the organization and staff members, I addressed the meeting with my remarks translated into Japanese by Rie Monika. The title of my short presentation was The Role of Asbestos Victims in the Campaign for Asbestos Justice, a topic which proved to be of considerable interest. Before the AGM was brought to a close, Mr. Ochiai came to the front of the room and his prepared comments were read out by his friend Mr. Yasumoto. Thanking the Group's members for their support of his Presidency, he expressed his best wishes for the work of his successor President Kaoru Matsuda. He urged his colleagues to continue the fight for all the victims of asbestos-related diseases. A series of group photographs was then taken. Having drawn the business section of the meeting to a close, it was time for a musical interlude. 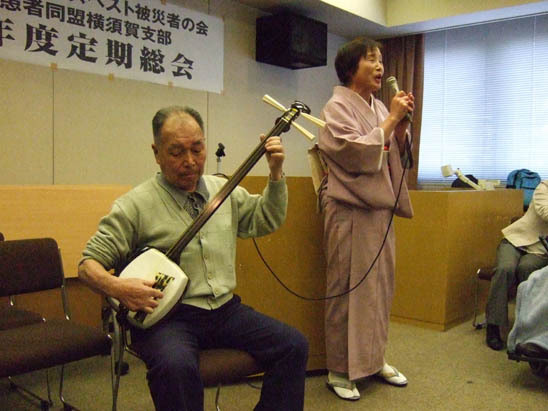 Asbestosis victim and musician Kanou Sato is a teacher of the shamisen, a three-stringed plucked musical instrument. He played a selection of folk songs accompanied by his former student Ms. Yuko Kurita. From left Kanou Sato and Yuko Kurita. The room was then rearranged and within a short time, the meeting had been transformed into a social gathering with plates of sushi and other delicacies laid out decoratively on each table. There was beer to wash it down which proved extremely popular with many of the Group's members. The next day, Sunday (November 25) was the date for the book launch of the Japanese translation of the IBAS monograph: Eternit & The Great Asbestos Trial. Professor Takehiko Murayama and I went by train to the city of Omiya, about 40 miles from central Tokyo, which had for more than fifty years been the location of the largest factory of the Japan Eternit company. 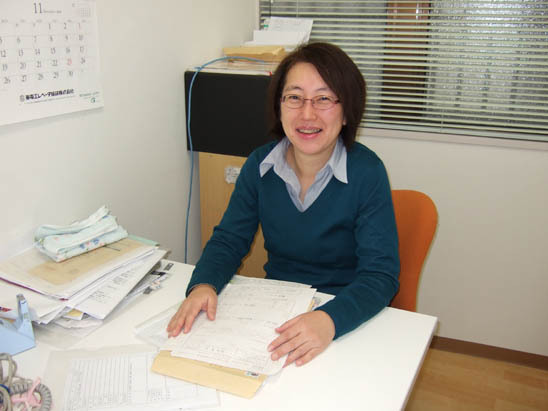 Our host, Ms. Hiroko Murakami, from the Nippon Eternit Pipe branch office of the Tokyo Labor Union, had herself worked at this factory. For five years, she was involved in sampling and testing the asbestos fiber used at the factory. The next five years, she spent testing samples of asbestos-cement piping produced at the factory; it contained between 20-30% crocidolite asbestos. Ms. Murakami has serious concerns about the health consequences of her occupational exposures. Mr. B lived near the site of the Eternit factory in Omiya. His brother and father worked at the factory and brought their work clothes home. None of them knew about the dangers of asbestos. Although there are many people who have become ill due to environmental exposures to Eternit asbestos, none of the cases brought by residents against Eternit has succeeded  yet! Mr. Y's father, an electrical engineer for Eternit, has mesothelioma. Speakers representing asbestos victims from Amagasaki City  the Amagasaki Association of Victims and Families of Asbestos Victims  and Nagasaki also participated in the meeting and explained the ongoing battles against Japanese companies like Kubota and Mitsubishi currently being fought by asbestos victims. Considering the struggle for justice being waged by Eternit's victims in Japan, the subject matter of the IBAS monograph was of interest to the audience. Although Chapter 18 focused on the situation in Japan, the majority of the text was about the iconic criminal trial in Italy of former asbestos executives. My presentation Achieving Justice for Eternit's Asbestos Victims took the Italian trial as the starting point for an exposition of other legal victories by Eternit claimants all over the world in 2011-2012. Although I spoke in English, my presentation was translated by Ms. Eiko Tomiyama, one of two translators who had produced the Japanese version of the Eternit book. There was a lively question and answer session about the international experience of Eternit victims before a group photo was taken. With the serious segment of the day's activities completed, participants adjourned to a nearby hostelry for some refreshments and music. Reflecting on my time in Japan, it is of some consolation to recognize the strides which have been made in obtaining medical assistance, government benefits and legal victories for the injured since GAC 2004. However, when set against the personal tragedies experienced by so many victims and families throughout Japan, many questions remain unanswered. Why did deadly exposures go unchallenged by the government for so long? Why did Japanese companies continue to use asbestos long after the dangers were known? What caused the complete failure of all occupational safeguards for at-risk workers? During my stay in Japan, I experienced two minor earthquakes. Fortunately, I slept through the first one which occurred late on November 23. The following day, I was wide awake and sitting in the hospice visiting Mr. Ochiai when the walls and ceiling began to shake. There was no doubt about what was happening but my Japanese friends were quite sanguine about what they viewed as a usual occurrence. I, on the other hand, was trying to work out the age of the building we were in and the likelihood that it contained asbestos. Fortunately, on this occasion the earthquake, which had a magnitude of 4.9, only lasted a few seconds. Last year's earthquake was a great deal more powerful and lasted a lot longer. In the immediate aftermath of the devastation which occurred in 2011, the asbestos hazard was overlooked by local agencies and national bodies.8 It was left to campaigning groups and NGOs to distribute state-of-the-art masks for emergency responders and begin to raise awareness of the asbestos hazard amongst members of affected communities. In such an earthquake-prone country like Japan, it is absolutely essential that the authorities set a deadline for the complete elimination of all asbestos from the national infrastructure and delineate a strategy to achieve this goal. Then and only then can future generations of Japanese citizens be safe from the asbestos hazard. 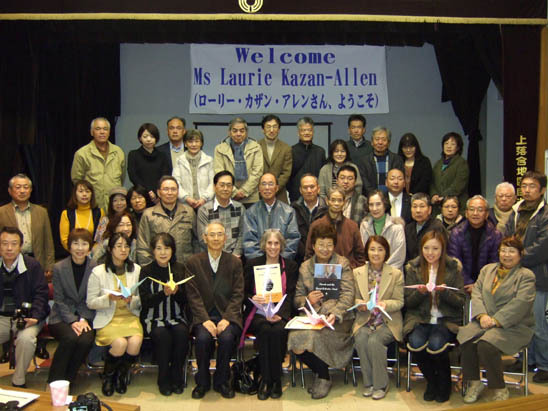 1 Kazan-Allen L. Asbestos Meetings in Japan. June 16, 2004. 2 Incidence of mesothelioma and asbestosis in Japan 1995-2010. 3 The Kubota Shock is a term commonly used to refer to Japan's awakening to the existence of a national epidemic of asbestos-related diseases and deaths. 4 Funds obtained as a result of legal victories by victims exposed to asbestos at the U.S. Naval Base in Yokosuka and the Sumitomo Heavy Engineering Company enabled the Pneumoconiosis and Asbestos Victims' Relief Fund to purchase this building in 2007. The name of the building Ajisai Kaikan was chosen by a competition amongst members of the victims' group; it means Hydrangea Hall. 5 Kazan-Allen L. Legal Victory for Railway Workers in Japan. January 3, 2009. 6 Kazan-Allen L. Dying for a Living. November 29, 2012. 7 Kazan-Allen L. Japan Eternit- An Unending Story. July 31, 2012. 8 Kazan-Allen L. Asbestos Fallout from Japanese Disasters. May 6, 2011.